NOTE: As this project is currently in planning, all information is subject to change. Loop 1604 at Blanco Rd. A DDI blocks straight-through traffic on the access roads. 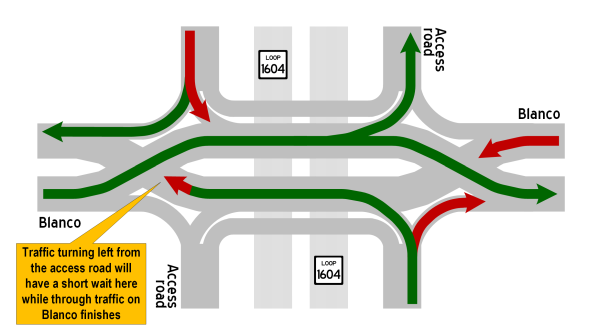 To accommodate this through traffic, a bypass (collector/distributor road) will be built below Blanco next to but separate from the Loop 1604 mainlanes. This bypass roadway will also serve Loop 1604 traffic headed to and from Huebner and Stone Oak Parkway. On the westbound side, this will produce the benefit of removing all that through traffic going to Huebner from the Blanco Road intersection. All of the entrance and exit ramps between Huebner and Stone Oak will need to be adjusted to accomodate the collector/distributor roads. This will be the first DDI in San Antonio and likely the sixth in Texas; the others are in El Paso, The Colony, Round Rock (next to the IKEA), South Austin, and College Station. The design has been used successfully in about 100 other locations around the US as well. Two other DDIs are planned for San Antonio: one at US 281 and Jones-Maltberger and another at I-37 and SE Military Dr.
TRAFFIC FLOW FOR BLANCO RD. The DDI will help reduce current and expected future congestion at this intersection. Current and projected traffic volumes are sufficient to cause level of service "F" (congested) conditions during peak periods now and into the future. (You can learn more about levels of service here.) However, flyovers are not considered to be a good option for this location. Thus, this intersection is considered to be ideal for an "outside-the-box" (no pun intended) intersection design. Computer modeling shows a dramatic improvement in this intersection's operation with this project. For example, it is projected that it would take through traffic on Blanco (either direction) 16 minutes to get through this intersection during the afternoon rush hour in 2037 with no improvements; with the DDI, it is projected to only take about four minutes. The left turn from eastbound Loop 1604 to northbound Blanco is projected to take 29 minutes during the afternoon rush hour in 2037 with no improvements, but also just four minutes with the DDI-- an 86% improvement! The traffic turning left from the access road will encounter a second red signal at the crossover point on Blanco where they will wait for through traffic on Blanco to complete their crossover. However, because both movements started at the same time, the Blanco crossover will be nearing completion by the time the left-turners reach that location, so their wait will be short and more than offset by the overall reduction in delay that this intersection provides. The diagrams below should help to illustrate the description above. Note that the description above is simplified to help explain the concept; the actual phasing and timing of signals is a bit more complex and may vary somewhat from what is described above. Simplified timeline showing example signal phase timings for each movement in the Loop 1604/Blanco intersection. Note that these timings are simplified for illustrative purposes only; they do not represent actual timings and the actual phasing is a bit more complex. Be sure to read the explanation in the paragraph above. Signs, markings, and signals: To properly control traffic and minimize potential conflicts, traffic signals will be located at the crossover locations as well as the left turns from the access roads. The dual right turn lanes on the westbound access road will also be controlled by a signal (this is not required for the DDI but is typical for dual right turn lanes.) These are all simple, two-phase signals that will be tightly coordinated and operated from the same signal controller. Additional lane markings and signage (including large overhead signs on Blanco) will help channel traffic into the correct lanes. 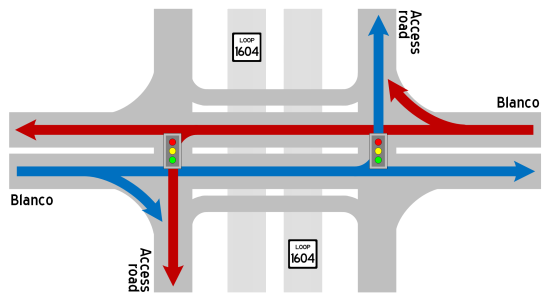 The crossover intersections will be angled sufficiently to make the crossover transition much more intuitive; engineers have learned from previous projects the optimal angles for this. Additionally, barriers will be placed between the opposing traffic lanes in the "wrong-side" area to obscure the oncoming traffic from view and thus reduce possible confusion or panic that might be caused by seeing oncoming traffic to your right. Driving through a DDI is actually far easier than it may seem from the diagrams and descriptions. Improvement statistics: A study of the DDI built in Round Rock in 2016 showed that despite a 50% increase in afternoon peak period traffic volumes after the DDI was completed, travel times improved 44-58% over the previous conventional intersections. Safety is also improved at DDI intersections. A DDI reduces the number of potential crash points from 26 to 14 with the worst type (side-angle collisions) reduced from 10 to just two. Additionally, a DDI physically prevents drivers from turning the wrong way onto the access roads, thus helping to prevent head-on collisions. A study at DDI intersections in Colorado showed a 36% reduction in crashes, and a 60% reduction was reported at a DDI in Springfield, Missouri where 97% of drivers reported they felt the DDI was safer than the previous conventional intersections. Drawbacks/cons: The main negative of this intersection is that straight-through traffic on the access roads will not be possible. While there will be a bypass road for through traffic below the intersection, it will not be accessible for traffic with origins or destinations in close proximity to the intersection (e.g. Starbucks, Jim's, Luby's, etc.) This means many drivers headed to or from those locations via the access roads may have to use an alternate (and possibly circuitous) route. The impact of this should be fairly limited and is a small trade-off for the significant overall improvements this change will bring. Finally, as with anything new and unconventional, there will be some skepticism and initial confusion while drivers learn the new traffic patterns and adapt. And there are always some naysayers who will perpetually denigrate anything different, innovative, or outside their comfort zone or understanding. Construction is not yet scheduled. As of this writing, it is anticipated that work could begin in 2021 and take about two years to complete. This looks confusing. It will cause lots of crashes. While it may look complicated on the schematics, it's actually fairly easy to navigate on the ground. See the "how-to" video at the bottom of this page. Statistics from DDI implementations show a significant reduction in crashes and practical experience from other DDI locations shows drivers quickly adapt to it. How does this improve traffic? This intersection design improves traffic because shifting the traffic to the left side of the road through the intersections removes the conflicts between left turns and opposing traffic found in a conventional intersection. As a result, traffic in two of the four legs of the intersection can move during a single green phase instead of needing two separate phases. This reduces the total number of green phases required from four to two, thus moving about twice as much traffic through the intersection in the same amount of time. The new third lane on Blanco needs to extend further or it will create a bottleneck. The scope of this project was limited to this intersection and immediate vicinity. The additional lanes that will be added on Blanco are considered to be "auxiliary" lanes intended to help traffic get through the intersection and then smoothly merge back into the through lanes. If additional capacity is needed on Blanco beyond this point, that is a much bigger project requiring separate study and additional funding. That said, TxDOT has said it will monitor the situation after implementation. Keep in mind that due to funding and other constraints, road improvements often need to be incremental, much like unkinking a hose one kink at a time. It looks like there will be no straight-through traffic on the access roads. This will prevent access to nearby businesses, severely inconvenience drivers, and cause extra traffic on Blanco. This will also block westbound through traffic headed to Huebner. 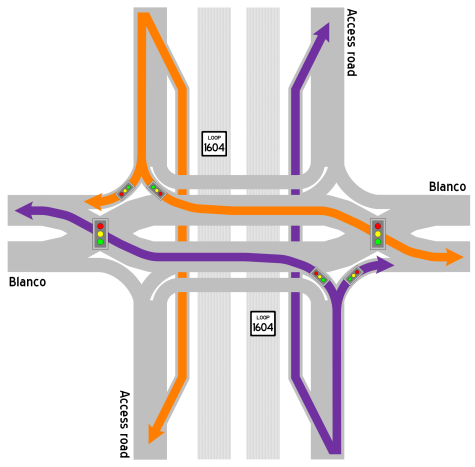 It is correct that traffic on the access roads will have to turn left or right onto Blanco. Keeping the through movement on the access roads would cancel-out much of the improvement this design provides. 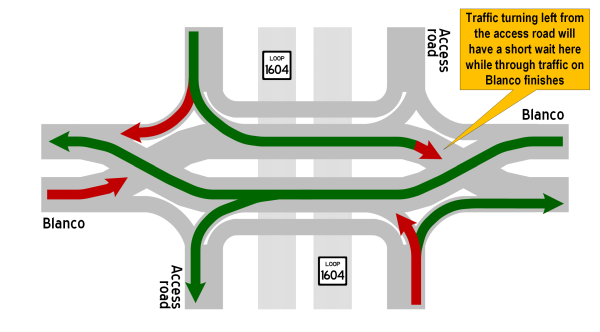 However, an access road bypass will be provided below Blanco (next to the Loop 1604 mainlanes) that will allow most of the traffic that would normally go straight through the intersections on the access roads to instead pass below without stopping. This will have the major benefit of taking traffic going to and coming from Huebner out of the Blanco intersections. The ramps to and from this bypass will be located about 1000 feet from the Blanco intersection, so motorists going to or from businesses located between these points may need to turn onto Blanco and make a U-turn to get to or depart from those locations; this will most especially affect the businesses at the NE and SE corners; the shopping centers at the other corners have plenty of access points that will minimize the affect of this change. While this is a bit of an inconvenience, it is no more so than what is required on streets with medians or when accessing businesses on the opposite access road between interchanges and is a small trade-off for the significant improvements this change will bring. Will there still be turnarounds? Yes, the turnarounds in both directions will remain. Why not just add the extra turning and through lanes? While this would help move more vehicles through the intersection on each cycle, the improvements would be short-lived as traffic increases to fill the new lanes. The DDI dramatically improves the underlying efficiency of the traffic signals themselves which provides longer-term relief. Why not build flyovers instead like the ones at Bandera and Loop 410? This intersection does not have current or projected traffic volumes or patterns to justify flyovers. How is this different than the intersection under construction at Bandera and Loop 1604? 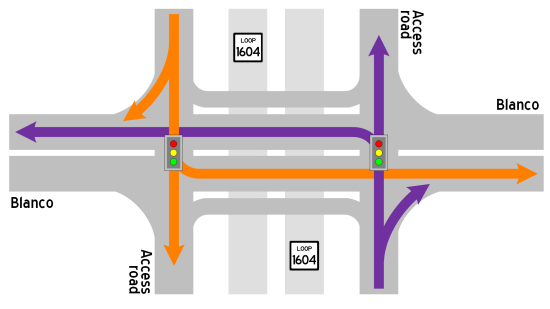 The DDI is similar to the Displaced Left Turn (DLT) intersection being built at Bandera and 1604 in that they are both considered to be types of "innovative" or "alternative" intersection designs that make signalized intersections function better by removing the inefficiencies caused by protected left turns. Both intersection designs do this by moving the left turns over to the other side of the road and out of the way of oncoming traffic. However, in the DLT, it is just the left turns that are shifted to the other side of the road whereas the DDI moves both left-turning and through traffic over. A DLT has its crossovers further away from the main intersection and requires more signals and right-of-way than a DDI. Also, the DLT does not block through-traffic on the access road like a DDI does. Finally, a DLT does not eliminate the conflicting left turns from the access roads to the cross street like a DDI does. Are any other DDIs planned in San Antonio? Yes, two other DDIs are currently planned: one at Military and I-37 and another at Jones-Maltsberger (South) and US 281. Other alternative intersections are also being planned for other locations; see the alternative intersections page for more info. Who came up with this cockamamie design? The DDI design has been used in France since the 1970s and made its debut in the United States in 2009. It is now in use in nearly 100 locations in the US and internationally and has a proven track record of improving traffic and safety wherever it has been implemented. It is one of several types of "innovative" or "alternative" intersection designs being implemented across the country at intersections that do not warrant more expensive conventional upgrades (e.g. flyovers.) 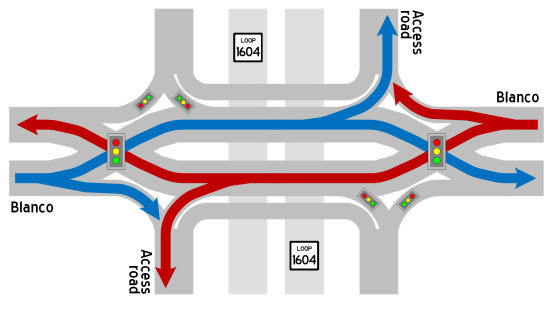 TxDOT selected this design for this intersection after studying multiple other options. Computer modeling showed this design provided significant improvement in operations with substantial reduction in delays. The DDI concept was hailed by Popular Science magazine as one of the top 100 innovations in 2009 and has been featured on National Public Radio and in Time, Forbes, and many other publications. Click on the images below to open the detailed schematics for this project from TxDOT with my own annotations added to help clarify and explain the various elements. Each schematic will open in a new window that you can scroll and zoom. These are the schematics presented to the public in March 2019.